Always work in the Neutral Posture. Observe how you child uses the computer and then adjust the workstation arrangement so that s/he is working in the most neutral posture that you can achieve. The normal work area is the space that can easily be reached by your child while s/he is sitting comfortably in the chair without her/him having to unduly bend or twist their body. Bring those items that your child uses most while working at the computer within this normal work area. If you child types from a text document or book, make sure that this is placed in a document holder and that it is as close to the screen as you can get it so that your child doesn't have to twist her/his head unnecessarily. The computer screen should be positioned so that your child can comfortably view the screen without having to noticeably tilt her/his neck backwards or forwards. If the screen is too high, your child's neck will be tipped backwards, and if it is too low it will be bent forwards. You should change the height and angle of the screen to avoid these postures. 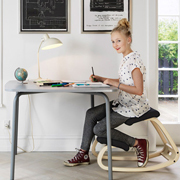 The following furniture and equipment is can help you to create the most comfortable and adjustable workstation arrangements for you and your child as s/he grows. a stable desk/worksurface - make sure that your child is working with a computer that is placed on a stable work surface. Use a negative slope/tiltdown keyboard system for a height adjustable keyboard/mouse platform check the fit of the keyboard and mouse to the size of your child's hands. If you child has small hands then consider using a smaller keyboard for a better fit. Check that the computer screen is free from glare spots (bright lights). To do this you may have to reposition the screen or adjust the room lighting. Make sure that there is sufficient light on any paper documents that your child is reading by using a freestanding adjustable brightness task light. A child, especially a very young one, may not be very aware of their seated position therefore, it is especially important for the adult to notice and try to correct the child's posture. Children may respond more to images than to writing when it comes to learning about the ideal workstation posture. Pin up "before" and "after" pictures of workstations by their desk. Children, especially the younger ones, have smaller hands than adults. A conventional keyboard may be too large for him/her. There is computer hardware available on the market today that is especially designed for children's small hands. Sometimes children like to use trackballs instead of mouses because their small hands find them easier to handle. A small mouse would be just as good. Children may find it more difficult than adults to know when to take breaks from typing or surfing the web. Thus, monitoring your child is very important. Being able to adjust chairs, monitors, desks, etc., is very important for children to know how to do in order to be comfortable. Be sure that they understand and are physically strong enough to do so (some mechanisms are even difficult for adults). Adjustability is absolutely essential when a family shares a computer workstation. The computer is going to be an important tool in students' lives. We need to pay attention to how the computer is introduced to ensure students learn useful strategies on how to set up their workstations and develop good work habits. Understanding and Implementing Ergonomic principles is a critical component in this learning process and need to be incorporated into all aspects of computer use in schools and at home. Choose a chair position in which the student can sit with his/her feet fully supported on the floor. The knees should not be higher than the hip joints as this places increased stress on the back tissues. The keyboard/mouse should then be lowered so that when the elbows are bent to about 90 degrees and the upper arms are relaxed at the sides of the body, the keys are right under the fingers. A chair needs to be chosen that will place the student at a height such that when the elbows are bent to 90 degrees and the upper arms are relaxed at the sides of the body, the keys are right under the fingers. For most children, this will mean use of a higher chair and their feet will not be supported. A footrest should then be added to support the feet. Alternatively, find a lower surface to put the computer on. What about using a laptop? Change position every 15-20 minutes and take a complete break to get up and move your body every 30-60 minutes. If your hands are large and using the laptop keyboard is uncomfortable, plug in a regular keyboard. You can also plug in a regular mouse. Some students will find that looking down at the laptop screen is comfortable while others may find that it bothers their neck. If it bothers you, when you can, plug in a regular monitor and place it so that the top of the screen is at or below eye level. Laptops are great for allowing you to change position...you don't always have to sit at a desk but keep the basics, above, in mind. Our team have unparalleled knowledge when answering your calls. If for any reason we are unable to answer, leave a message and we will call you back.